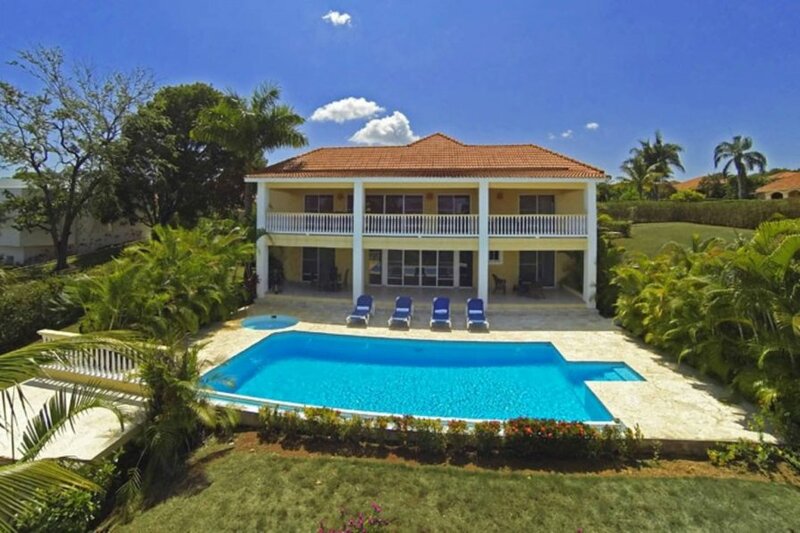 This 4 bedroom villa with swimming pool is located in Sosua and sleeps 8 people. It has WiFi, parking nearby and air conditioning. This unique villa offers the comfort of 4 large bedrooms and 4 ½ bathrooms split on 2 floors. Main floor has spacious family living room, large fully equipped kitchen, terrace convert into dining room and sitting area with great ocean views, master bedroom (king bed) with en suite bathroom and 2nd bedroom (2 queen beds)with en suite bathroom. Bottom floor has 2 bedrooms (queen beds) with 2 bathrooms, sitting area / small kitchen and direct access to the oversize swimming pool / Jacuzzi. The villa offers TV cable, Internet connection and daily maid services. Walking distance to Sosua activities and 10 minutes drive from Puerto Plata International airport. Maximum eight (8) guests in the villa.